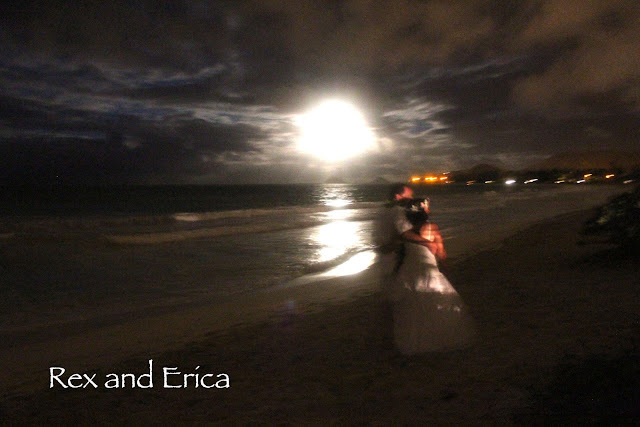 When my good friend Erica invited me to photograph her wedding on Oahu on 4th of July I couldn't say no. I knew Mardochee would be out of school and would enjoy a vacation in a warm, tropical climate similar to Haiti too. So I started checking prices -- of flights, lodging, and rental cars. I did really well on the rental car, got a Kia for a week for $200 including tax and unlimited miles. I checked out airbnb.com to find a room. I chose Ko'olau Valley Stream with a sweet family for $58 a night for the three of us. But I couldn't find a flight for less than $700 round trip. So I decided to see if I could go to Hawaii as a stopover to somewhere else. For $400 extra I was able to add on the Philippines for two weeks, so I jumped on it. I've never been to the Philippines before, but I grew up with so many Filipinos in San Diego because it's a navy town. My first husband's family was from Guam, also in the navy, and a similar culture with the Spanish/Catholic influence. Both countries eat adobo and lumpia and lots of rice. Rather than send Mardochee back to Santa Cruz by herself, I invited our friend Yvette to join us in Hawaii. I met Yvette in Haiti after the earthquake. She's an amazing woman who traveled to New Orleans after Hurricane Katrina and helped out. She did the same after the earthquake in Haiti, staying 7 months on her first trip. She helped me a lot with Mardochee in Haiti when we were doing all the medical requirements for the visa. Guess what? She couldn't say no to a trip to Hawaii either. We had a full week, but it never seemed busy or stressed. We visited Aloha Towers Honolulu for lunch the first day, walked on Waikiki Beach, saw fireworks on the beach, ran into Erica and Rex, explored historic Honolulu, North Shore with Maggie's niece Nikki who's living at a hostel near the beach, learned a lot at the Bishop Museum, went to breakfast with Erica and Rex at their rented house at Kailua, a pre-wedding pizza party, photo session with the hula dancers, the beautiful wedding on July 4, and the grand finale at the Polynesian Cultural Center. View from the plane as we land in Honolulu airport. Mardochee at the Gordon Biersch restaurant at Aloha Towers. Hawaiian dancers lure Japanese tourists aboard a bay cruise. Mardochee's blue dress looked great on the blue stairs. Japanese tourists are everywhere in Hawaii. This is NOT the car we rented for the week. As my friend Jennifer said, maybe he was trying to tan his inner thighs. By chance, we ran into the bride and groom while walking on Waikiki Beach. They sing and play piano amazingly well, and are very friendly and appreciative with their fans. We drove to North Shore to spend the day with Maggie's niece Nikki. It's hard to see the 20 years age difference. Mardo is 13 and Nikki is 33. Nikki was also an instant friend with Maya too. 22 years age difference here. Nikki is fulfilling a dream by moving to Hawaii. Nikki and Mardo wear their flowers over the right ear to show they're available. Honolulu Beach where the locals hang out. Here are some local kids having fun. Father and daughter enjoy the sun and sand. Stand-up paddles are popular now. $150,000 on a 40-minute show that takes 3 days to unload from the trailers. Honolulu skyline as seen from the beach. Mardo took this picture of me. I think I look really young and happy here. Bishop Museum. You really need a couple of days to see it all. Native Hawaiians get revenge on Captain Cook. At the interactive children's center Mardochee pretends to run a food store. The pool at the YWCA looked tempting. The day before the wedding I was invited to photograph during the hula rehearsal. The sandy slope made a nice background too. One last quickie under the palms before the rains returned. Ananth, college friend of Erica, and his beautiful family. Erica with her sister Karen and family, and her mom Nina with husband Dave. The Fiji chief always had the largest hut in the village. Our canoe driver Kahikina from Tuvalu. He explained that his island country has 7000 people. He had to go to high school on neighboring island Fii. That's where he learned English, which he speaks very well. Nikki and Mardo blend in a lot better than I do. Mardo shows off her princess, queen, and warrior tattoos. Entry fee included a buffet dinner and spectacular luau show, complete with amazing fire dancers. With Car Rental 8 you can discover the most affordable car hire at over 50,000 locations globally.